Following a major survey of his work at Wollongong City Gallery in 2007 which included a number of his relief constructions, Andrew Christofides began to revisit the ideas surrounding these constructions - which had been a significant part of his output prior to 1993. The ‘Harmony of numbers book project’ was part of this process of exploration. The project consisted of three stages. 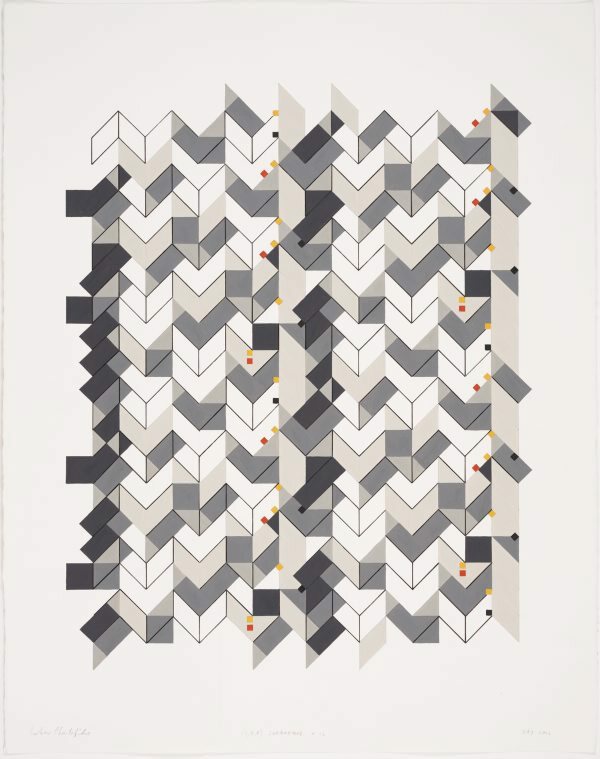 The first was a set of working drawings based on number sequences deriving from variations on the mathematical number sequence known as the Fibonacci Series. The second was to make works on paper deriving from these which were larger and intended to provided visual information for his final intended relief constructions. The third stage was the creation of a set of relief constructions. This is the sixth finished drawing. Signed l.l. corner, pencil "Andrew Christofides". Dated l.r. corner, pencil "May 2012".